We are in the midst of enjoying the divine glories of AzhwArs/AchAryas who appeared in this auspicious month of aippasi. Please view http://ponnadi.blogspot.in/p/aippasi-thula-masa-anubhavam.html for full glories of this month. We shall now get a glimpse of our most merciful piLLai lOkAchAryar and his divine work thathva thrayam (tattva trayam) through the most beautiful vyAkyAna avathArikai (introduction to commentary) of maNavALa mAmunigaL for this master piece. thathtva thrayam is glorified as kutti bhAshyam (miniature version of srI bhAshyam). emperumAnAr wrote detailed commentaries for braham sUthram which became to be famously known as srI bhAshyam and emperumAnAr became to be famously known as srI bhAshyakArar. This is because, it contains all the essential principles of our visishtAdhvaitha sidhAntham in the most comprehensive way as outlined in srI bhAshyam in easily understandable sUthrams (aphorisms) in thamizh. This grantham discusses the three fundamental principles namely chith (jIvAthmAs), achith (matter) and Isvaran. A brief summary of this grantham can be viewed at http://ponnadi.blogspot.in/p/thathva-thrayam.html. With this background, let us now see the translation of thathva thrayam's wonderful introduction given by mAmunigaL. As mentioned in "anAdhi mAyayA suptha:", since time immemorial, jIvAthmAs in this samsAram due to their connection with matter which causes ignorance (darkness), their intelligence being totally subdued, exist without understanding that jIvAthmA's nature is different from matter (i.e., filled with knowledge and bliss and fully exist for the pleasure of bhagavAn only). As said in "yOnyathA santhamAnam ananyathA prathipathyadhE, kim thEna na krutham pApam chOrENAthmAbahAriNA", jIvAthmA misunderstands the true nature of the self and commits the biggest of all sins (which is the cause of all other sins), i.e., stealing jIvAthmA which is the property of bhagavAn (considering bhagavAn's property as ones own) and engages in enjoying worldly pleasures which are insignificant and temporary. As said in "vichithrA dhEha sampaththir IsvarAya nivEdhithum, pUrvamEva kruthA brahman hasthapAdhAdhi samyuthA", when the jIvAthmA is in a subtle state (during layam) just like matter (intelligence fully subdued) without any senses/body and not being able to engage in worldly enjoyment or efforts towards emancipation, the most merciful sarvEsvaran, blesses the jIvAthmA with senses/body to begin the process of approaching bhagavAn's lotus feet. The jIvAthmA, instead of using the senses/body to approach bhagavAn to be uplifted, as said by nammAzhwAr in thiruvAimozhi 3.2.1 "annAL nI thantha Akkaiyin vazhi uzhalvEn", goes by the bodily/sensual pleasures, just like a person who was given a raft to cross the river goes with the flow of the water and falls into ocean, the same senses/body that were given to the jIvAthmA to be uplifted from this samsAram were used to engage in samsAram more and more. The jIvAthmA, since time immemorial, has accepted many many births due to endless virtues/vices which was caused by ignorance. In those births, he goes through most miserable sufferings (thApa thrayam - 3 types of sufferings) and without understanding the effects, he engages in karmA and goes through several stages such as garbha (being in the womb), janma (taking birth), bhAlya (being a child who cannot take care of himself), yauvana (youth which is fully focussed on sense enjoyment), vArdhaka (old age), maraNa (death) and naraka (life in hellish planets) and goes through endless sufferings. 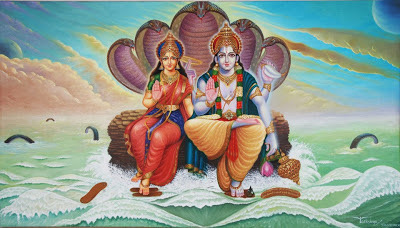 Seeing that the jIvAthmA is suffering through endless miseries in this ocean of samsAram (which is filled with troubles), the most merciful bhagavAn, who is the well-wisher of everyone and who is constantly making efforts to uplift the jIvAthmAs, sympathises for the sufferings of jIvAthmAs as mentioned in "Evam samsruthi cakrastthE brAmyamANE svakarmabhi: jIvE dhukkAkulE vishNO: krupA kApi upajAyathE". Out of great compassion in his divine heart, as mentioned in "jAyamAnam hi purusham yam pasyEn madhusUdhana: sAthvikas sa thu vigyEyas sa vai mOkshArththa chinthaka:", bhagavAn blesses jIvAthmA at the time of birth which leads to inquiring on how to be uplifted from this samsAram. For a mumukshu (one who desires mOksham), there is no possibility to attain mOksham without the proper understanding of the true knowledge. One can learn the true knowledge in two ways: from sAsthram and through upadhEsam (from preceptors). As said in "sAsthra gyAnam bahu klEsam" - since sAsthram is endless and there are many seemingly contradictory statements, for a common man, it will be difficult to easily study the sAsthram and understand the purports. That is why this is difficult to pursue. Even if one is prepared to undergo difficulties in studying sAsthram, as said in "ananthabhAram bahuvEdhithavyam alpachcha kAlO bhahavachcha vignA:", there is so much to learn, but jIvAthmAs (bound souls) have limited intelligence and a limited life span and there are so many hurdles while trying to study sAsthram. Finally, even though women and shUdhras qualify to be mumukshus (one who desires for mOksham), they are not qualified to study sAsthram. Learning from preceptors have none of the above limitations (as they understand the essence and purport of the sAsthram and transmit the same to the disciples/students in very simple language). 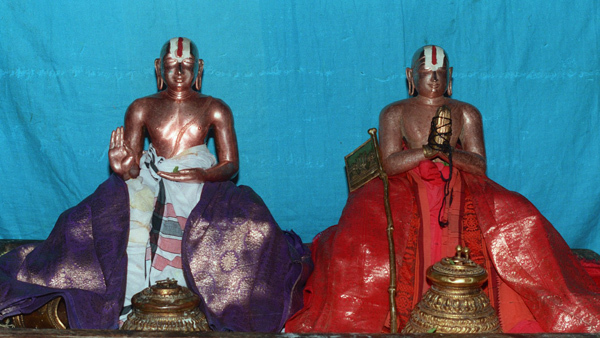 Contemplating on this principles, the most merciful piLLai lOkAchAryar who is an expert in all sAsthram and being focussed on the upliftment of all jIvAthmAs, explains the true nature and qualities of the three entities (chith, achith and Iswara) in the easiest way to understand and in the most crisp manner. Note that these principles are present in sAsthram but they are inaccessible for every one easily - so out of his great compassion piLLai lOkAchAryar compiled them in this prabhandham (thathva thrayam). never looking for any personal fame, glory, etc. Even though AzhwArs were said to be EkagaNtar (one neck with many faces - meaning they all talk about the same principles), by seeing many AzhwArs talk about the same principle, the principle becomes more trustworthy - if many of (trustworthy) persons glorify a particular object, the object becomes well established. Similarly, AchAryas also being EkagaNtar explain the same principles in various granthams so that even the least-intelligent person will also look at several great personalities write about the same principle and become convinced about the validity of the same. Also, what is discussed briefly in one grantham will be discussed in detailed in another grantham. So the different granthams are complimentary to each other. This same principle applies for the cases where the same AchArya writing many granthams on the same principle. The principles are well established and the different granthams compliment each other. Thus ends the most magnificient introduction section for thathva thrayam. This grantham is greatly glorified for presenting the most complicated principles of our visishtAdhvaitha sidhAntham in the simplest possible way. With mAmunigaL's beautiful and precise commentary, this is a great treasure for us to cherish. It is most beneficial if this grantham is heard under an AchArya to understand the principles fully. Let us bow down at the lotus feet of these great AchAryas and be blessed. Previously, the three principles - chith (jIvAthmAs), achith (matter) and Isvaran were discussed in very simple terms and the same can be viewed at http://ponnadi.blogspot.in/p/thathva-thrayam.html. We are in the midst of enjoying the divine glories of AzhwArs/AchAryas who appeared in this auspicious month of aippasi. Please view http://ponnadi.blogspot.in/p/aippasi-thula-masa-anubhavam.html for full glories of this month. We shall now get a glimpse of our most merciful piLLai lOkAchAryar and his divine work mumukshuppadi through the most beautiful vyAkyAna avathArikai (introduction to commentary) of maNavALa mAmunigaL for this master piece. piLLai lOkAchAryar mainly compiled 18 rahasya granthams (confidential matters). Of these 18 granthams, mumukshuppadi, thathva thrayam and srIvachana bhUshaNam are considered as kAlakshEpa granthams. kAlakshEpa grantham is that which is to be studied under an AchArya in a word-by-word manner with the help of the commentaries and further explanations. 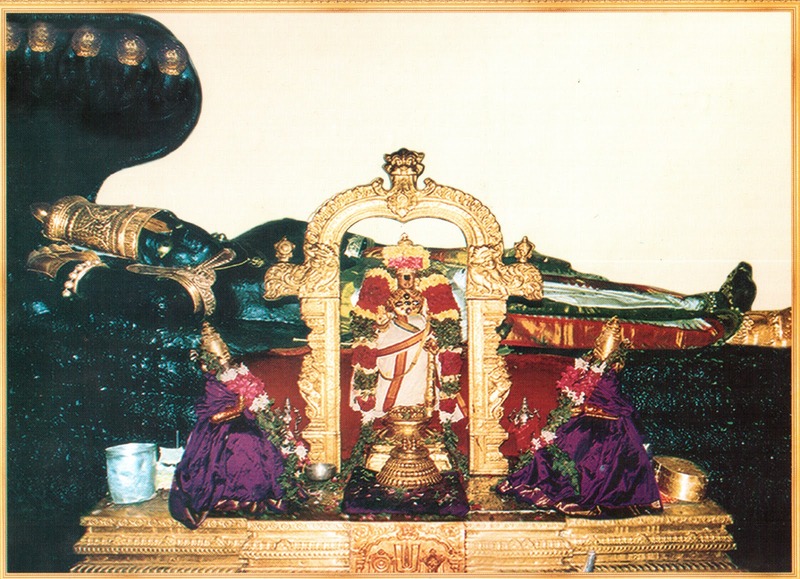 mumukshuppadi is the most precise documentation of the three rahasyams namely thirumanthram (Om namO nArAyaNAya), dhvayam (srIman nArAyaNa charaNau sharaNam prapadhyE; srImathE nArAyaNAya nama:) and charama slOkam (sarvadharmAn parithyajya mAmEka sharaNam vraja; aham thvA sarvapAbEpyO mOkshayishyAmi mA sucha:). thathva thrayam is also known as kutti bhAshyam (meaning a miniature srIbhAshyam) as it contains the essence of the principles that is explained in emperumAnAr's srI bhAshyam (which is a commentary for vEdha vyAsa's brahma sUthram). This discusses the three fundamental principles namely chith (jIvAthmAs), achith (matter) and Isvaran. A brief summary of this grantham can be viewed at http://ponnadi.blogspot.in/p/thathva-thrayam.html. srIvachana bhUshaNam is the most comprehensive grantham discussing the various important aspects of srIvaishNavam such as pirAtti's purushakArathvam (pirAtti's merciful nature in helping jIvAthmAs approach emperumAn), bhagavAn's upAyathvam (bhagavAn being the means to achieve him), srIvaishNava lakshaNam, glories of srIvaishNavas and finally AchArya abhimAnam (mercy of AchArya). mAmunigaL has written detailed and expert commentaries for these 3 granthams of piLLai lOkAchAryar which are most in-depth and enjoyable for true seekers of divine knowledge. With this background, let us now see the translation of mumukshuppadi's introduction given by mAmunigaL. sarvEswaran is the divine master of srI mahAlakshmi, seated in srIvaikuNtam (which has endless pleasures), being enjoyed by nithyas (eternally free souls) and mukthas (ones who were relieved from samsAram) and who is enjoying endless pleasures. Even being in such blissful situation, he looks at the samsAris (bound souls) in samsAram (material world) who too are eligible to live in paramapadham and enjoy endless pleasures, yet they are living in the material world like asath (the ones who do not understand brahmam are merely considered as matter which has no intelligence at all) without any knowledge about that opportunity. Feeling greatly anguished, when these jIvAthmAs exist without any senses and body during layam (dissolution) just like a bird without any wings (who wont be able to do anything), he begins his merciful efforts to facilitate their upliftment. First, he blesses the jIvAthmAs with senses and bodies. Without the senses and body, a jIvAthmA cannot function at all. The first action of bhagavAn is to thus provide them with the senses and body. apaurushEyam - It is not authored by any individual. Even bhagavAn is not the author of vEdham (as it is eternal) - bhagavAn is the perfect knower of vEdham and reveals it during every srushti (creation). srushti (creation), sthithi (sustenance) and layam (dissolution) also happen cyclically (since eternity). nithyam - it is eternal and always exist. As it is apaurushEyam (not created by any one), it always exists. nirdhOsham - blemishless - everything mentioned in vEdham is perfect as it is apaurushEyam. dhOsham arises due to something being created by individuals who have bramam (error), vipralambham (deceit - intention to cheat), pramAdham (negligence), ashakthi (inability). (Note: While certain aspects may apply for certain types of persons based on their own nature (sathvam - goodness, rajas - passion, thamas - ignorance), there is nothing faulty in vEdham). svatha: pramANam - its self-evident - no need to establish vEdham using some other pramANam - whatever mentioned in vEdham is valid on its own. 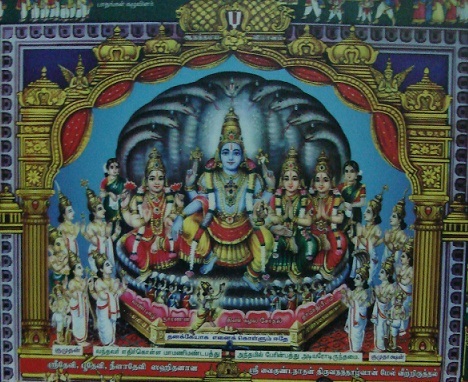 Amongst these rahasyams, he reveals thirumanthram at srI bhadhrikAshram as nArAyaNa rishi to nara rishi (who is also an amsam/incarnation) of bhagavAn. He reveals dhvayam at srI vishNulOkam to his dear consort srI mahAlakshmi. 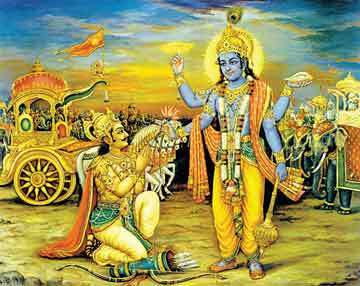 He reveals charama slOkam at the battle field kurukshEthram near the chariot as krishNan to arjunan. It is because of bhagavAn taking up this role of AchAryan, we remember him in the beginning of our guru paramparai as the prathamAchAryan (first AchAryan) as said in "lakshmInAtha samArambhAm" (beginning with the master of srI mahAlakshmi) thanian by kUrathAzhwAn. Though these rahasyathrayam (3 confidential aspects) are short in size, they have very deep meanings. The meanings of the same must be properly heard from proper lineage of AchAryas/learned scholars and only by such proper learning one can be uplifted. This is why our pUrvAchAryas taught and documented the rahasya thrayam with great focus. Coming in the lineage of such great spiritual preceptors, piLLai lOkAchAryar out of his great compassion, documents those essential principles in this grantham (mumukshuppadi). Even before writing this, he himself has explained rahasya thrayam in three different granthams named yAdhruchchikappadi, sriya:pathippadi and parantha padi. yAdhruchchikkappadi was too short and parantha padi was too detailed. sriya:pathippadi though did not have both the limitations (too short and too long), it was filled with samskritham (vEdham) words/terminologies which are not accessible for women and others. Wanting to write a grantham which has none of these limitations, piLLai lOkAchAryar mercifully compiled this grantham named mumukshuppadi. This is why, amongst all the prabhandhams (granthams), this mumukshuppadi is the prime focus of everyone. Further, some of the principles that were not explained in the previous prabhandhams are also present in this grantham - so this is glorified by all. After explaining the first rahasyam that is thirumanthram, piLLai lOkAchAryar mercifully explains the principles dhvaya mahAmanthram which reveals the nature of upAyam (means) and upEyam (goal) that are explained in the second padham (nama:) and third padham (nArAyaNAya) of thirumanthram respectively. piLLai lOkAchAryar himself in his previous 3 prabhandhams, explained thirumanthra, charama slOkam and dhvayam. But in this prabhandham, he is explaining dhvayam before charama slOkam - why so? Both sequence are shown by pUrvAchAryas. 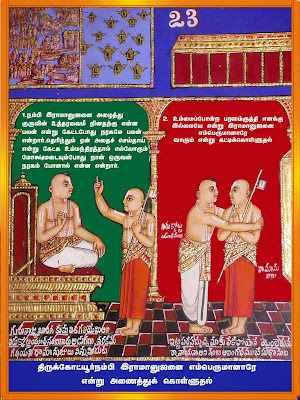 Both periyavAchAn piLLai in his parantha rahasyam and vAdhi kEsari azhagiya maNavALa jIyar in his rahasya thraya granthams have followed this sequence (thirumanthram, dhvayam and charama slOkam). The three rahasymas are explained as manthra, vidhi and anushtAna rahasyams. thirumanthram is manthram (that which is used to meditate to realize ones true nature), charama slOkam is vidhi (order/instruction - since bhagavAn orders what to give up and what to pursue) and dhvaya mahA manthram is for anushtAnam (constant practice). 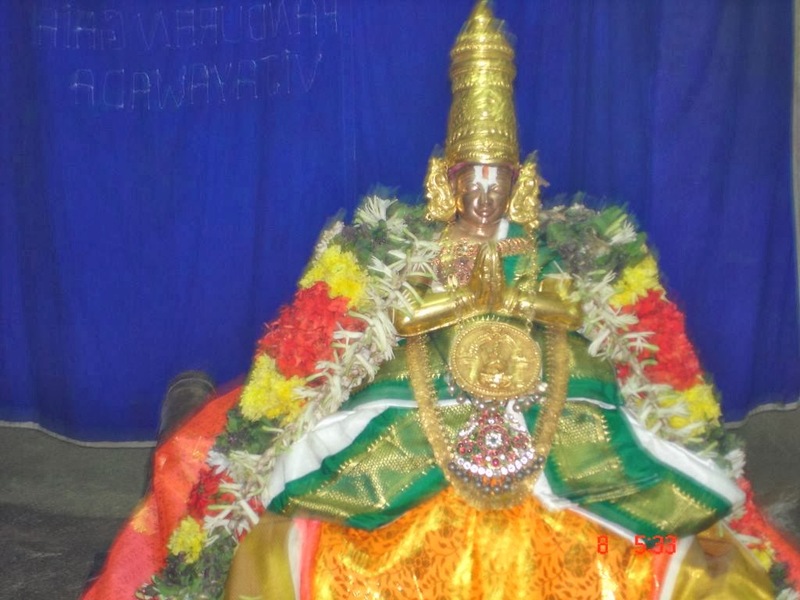 thirumanthram is split into two - praNavam (OmkAram) and namO nArAyaNAya (which is called manthra sEsham (remainder)). 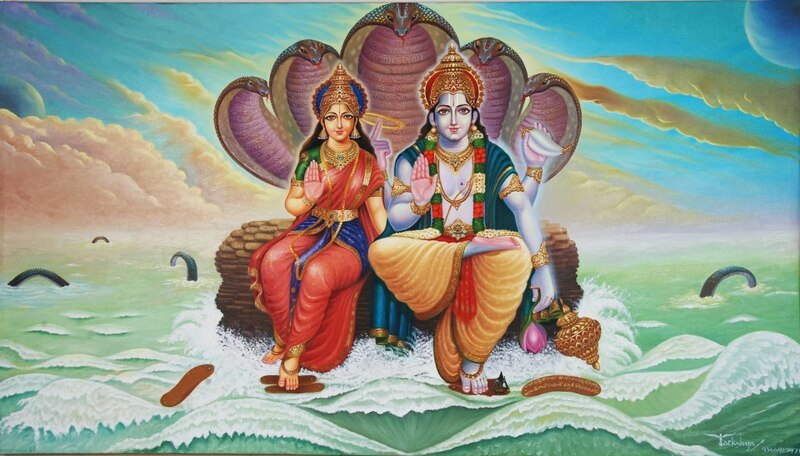 The nama: padham which explains upAyam (means) and nArAyaNAya padham which explains upEyam (goal) are explained in the two sentences in dhvayam. Further, the two sentences in dhvaya mahA manthram are explained by the two parts of charama slOkam. Thus, both sequence are acceptable. Since piLLai lOkAchAryar explained in one sequence (thirumanthram, charama slOkam, dhvayam) in the first 3 prabhandhams, with his desire to explain the other sequence (thirumanthram, dhvayam, charama slOkam), he is now beginning to explain the essential meanings of dhvayam. accepting bhagavAn as means is only a natural aspect of jIvAthma svarUpam and not the means in itself (only bhagavAn is the upAyam, our accepting is not upAyam). The second sentence of dhvayam focusses on doing self-less kainkaryam purely for the joy of srIman nArAyaNan. To be engaged in eternal kainkaryam, one must first be relieved from samsAram and bhagavAn himself guarantees that all hurdles in his path towards such eternal kainkaryam will be removed of him. To understand the meanings of this charama slOkam only, emperumAnAr walked to thirukkOshtiyUr nambi's residence at thirukkOshtiyUr from srIrangam 18 times. thirukkOshtiyUr nambi was more concerned about the deep meanings of this charama slOkam and not finding suitable candidates who are eligible to know the most confidential principle. To test srI rAmAnuja's Asthikyam (faith and dependence in sAsthram), nambi made him walk 18 times, enforced him to take a vow that he will not reveal the meanings to the unqualified and made him fast for one month before finally revealing the most confidential meanings of charama slOkam. But emperumAnAr observed the sufferings of samsAris (bound souls) and being overwhelmed by mercy and compassion, revealed the in-depth meanings of charama slOkam to eradicate their sufferings. Because of him revealing the meanings of charama slOkam, he becomes to be called as "emperumAnAr" by thirukkOshtiyUr nambi. While this was revealed by emperumAnAr and was further explained by the pUrvAchAryas, piLLai lOkAchAryar, out of his unlimited mercy wanting to uplift everyone, documented the divine meanings in many prabhandhams. Unlike other prabhandhams which are difficult to understand, in this prabhandam, he has explained the principles in a very simple manner so that even women and children (seekers) understand these principles easily. Thus ends the most magnificient introduction sections for mumukshuppadi. We should truly appreciate the most compassionate nature of piLLai lOkAchAryar in documenting this most complicated/confidential principles in the simplest possible way. mAmunigaL, being even more merciful, explained these divine sUthrams (aphorisms) of mumukshuppadi in the clearest possible way for everyone to understand and apply it in our lives. It is most beneficial if this grantham is heard under an AchArya to understand the principles fully. Let us bow down at the lotus feet of these great AchAryas and be blessed. Please read poigai AzhwAr's mudhal thiruvanthAdhi introduction at http://ponnadi.blogspot.in/2013/10/aippasi-anubhavam-poigai-azhwar.html. 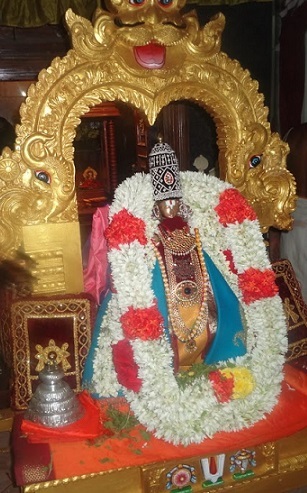 In mudhal (first) thiruvanthAdhi, poigai AzhwAr highlighted that bhagavAn is the master of both nithya (spiritual) vibhUthi (world) and leelA (material) vibhUthi (world). Seeing that bhUthathAzhwAr understands that he is a true servitor of bhagavAn and that gyAnam (knowledge) matures in to bhakthi (devotion). mudhal thiuvanthAdhi is focussed on gyAnam; iraNdAm thiruvanthAdhi is focussed on bhakthi. This dhivya prabhandham is the outpouring of AzhwAr's bhakthi. Does this mean that poigai AzhwAr does not have bhakthi? No - he also has bhakthi. It is different states of manifestation - one is cause and the other is effect. poigai AzhwAr's state is being in knowledge by meditating on the nithya and leelA vibhUthis (worlds) of bhagavAn. bhUthathAzhwAr's state is being in bhakthi (which is matured state of gyAnam). 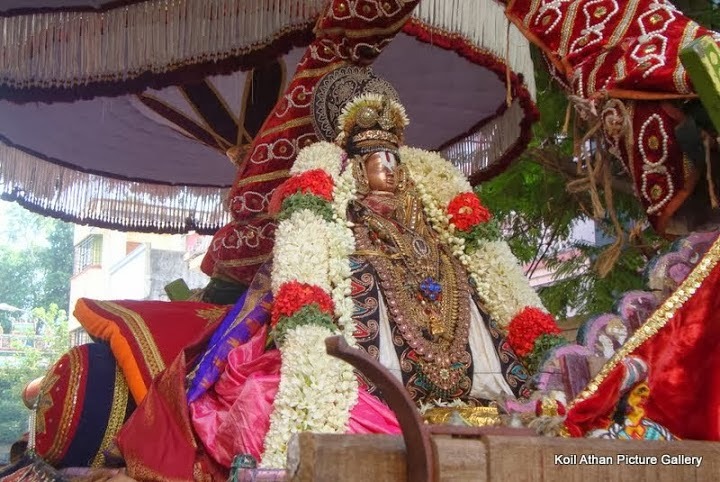 bhUthathAzhwAr meditates on the divine wealth of emperumAn as narrated in mudhal thiruvanthAdhi, and as a result, the overwhelming devotion leads into these pAsurams that become the dhivya prabhandham named iraNdAm thiruvanthAdhi. In mudhal thiruvanthAdhi, the gyAnam about the supreme is explained, i.e., bhagavAn is the lord of the entire universe and the universe exists for bhagavAn. It is also explained that, this knowledge is the means to reach bhagavAn. Generally, it is seen that the means and goal are different here. How is it possible that bhagavAn is upAyam (means) and bhagavAn is upEyam (goal)? Because he is omnipotent (capable of doing everything), he is the upAyam and upEyam. kAraNam (Cause) is explained as 3 aspects. upAdhAna kAraNam - the (raw) material which changes into the ultimate effect. For example, soil (earthen) becomes pot - here, soil is upAdhAna kAraNam (material cause) and pot is kAryam (effect). nimiththa kAraNam - the efficient cause - the person(s) who bring about the change in the material. For example, Potter is the one who changes soil to pot. sahakAri kAraNam - the ancillary cause - the tools that are used in bringing about the change in the material. For example, Potter uses a stick and a wheel to change the soil in to pot. Generally, we observe in this world that, the 3 causes are always different in this material world. Because he is omnipotent (capable of doing everything), he himself is all the three types of causes (Translator's note: upAdhAna kAraNam - chith (sentients) and achit (insentients) which are the raw-material are attributes of bhagavAn; nimiththa kAraNam - his own sankalpam (desire/vow); sahakAri kAraNam - his knoweledge, shakthi, etc). Thus he himself becomes all the 3 causes for the manifested universe. Since, he is the antharyAmi (in-dwelling soul) of the entire universe and since bhUthathAzhwAr is one of the subjects in this universe, he considers bhagavAn himself as upAyam (means) to reach the ultimate goal. Whatever is seen in general aspects will also be visible in specific cases. 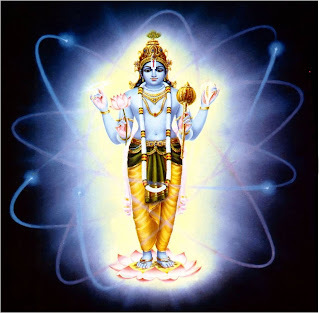 As bhagavAn is (explained by emperumAnAr in gadhyam as) "akila jagath svAmin" (அகில ஜகத் ஸ்வாமிந்) - the lord of entire universe, he is also (explained by emperumAnAr in gadhyam as) "asmath svAmin" (அஸ்மத் ஸ்வாமிந்) - my lord. As sAdhanam (means) is bhagavAn, one should be patient to let the knowledge blossom fully (and he will benedict the goal automatically when the knowledge is blossomed). 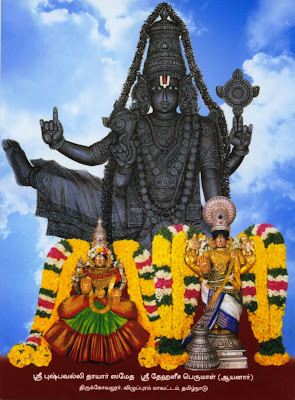 paramEsvara mangalaththu ANdAn goes to kurugai kAvalappan (who is a sishya of nAthamunigaL) and asked "what is the relation between jagath (universe) and Iswaran (bhagavAn)?" and kurugai kAvalappan asked him back "Which jagath and which universe?" - paramEsvara mangalaththu ANdAn was satisfied with that. It is explained that the universe is bhagavAn's body and bhagavAn is the in-dwelling soul (they are inseparable). Just like the sarIram (body) is subservient to the jIvAthmA (soul), the entire universe is body of bhagavAn. poigai AzhwAr contemplated on bhagavAn as "pathim visvasya" (பதிம் விச்வஸ்ய) - the master of entire universe as explained in thaithriya upanishadh. This principle applies to bhUthathAzhwAr as well. So, bhUthathAzhwAr meditates on that principle in iraNdAm thiruvanthAdhi. As these are just outpouring of different states of knowledge/devotion, should these thiruvanthAdhis not be compiled by the same author? Why is it done by different authors - mudhal thiruvanthAdhi compiled by poigai AzhwAr and iraNdAm thiruvanthAdhi compiled by bhUthathAzhwAr? thrimunivyAkaraNam is compiled by three sages (pANini, vararuchi and pathanjal), yet considered as one sAsthram since all of them talk about the same subject. jaimini compiled pUrvA mImAmsai (first 12 adhyAyams) and vyAsa compiled uththara mImAmsai (4 adhyAyams) - yet since both talk about the same brahmam (pUrvA mImAmsai talks about how to worship brahmam and uththara mImAmasai provides in-depth understanding about the nature of brahmam), they are considered together as single sAsthram. These prabhandhams are also considered similarly. 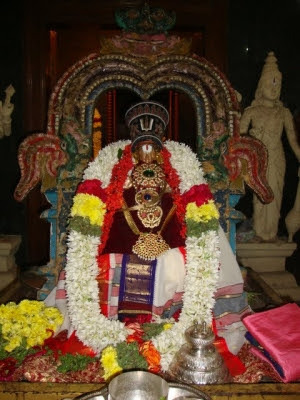 In mudhal thiruvanthAdhi, bhagavAn is explained as vichithra gyAna sakthi yukthan (abode of marvellous knowledge and fully capable of doing anything), jagath kAraNa bhUthan (the cause of the entire universe) and sankachakragadhAdharan (one who holds sankam (conch), chakram (disc) and gadhai (maze)). This is also explained due to bhakthi (devotion) towards emperumAn only. Even that seed of devotion was planted by bhagavAn only (as it was not there in AzhwAr before). Since bhagavAn is the upAyam, he is also the one who kindles the devotion in the heart (its not our own effort which plants the seed of devotion). Here, AzhwAr says just like bhagavAn's controlling/managing of such variegated universe is marvellous, bhagavAn planing this seed of devotion in AzhwAr's heart is also marvellous. Does poigai AzhwAr only have knowledge about the supreme lord? No, all AzhwArs have full knowledge and devotion - but the focus is on the aspects which AzhwArs themseleves focussed on. As all AzhwArs know the divine emotions of each other, they have revealed the same principles in their dhivya prabhandhams. Just like AdhisEshan has one neck and many heads, AzhwArs also share the same principles but reveal them as different individuals through different prabhandhams. Thus ends nampiLLai''s introduction to iraNdAm thiruvanthAdhi. Let us briefly see the thaniyan for iraNdAm thiruvanthAdhi which was composed by thirukkurugai pirAn piLLAn. thaniyans usually reveal the glories of the author of the prabhandham and the prabhandham itself. Simple translation: To be relieved from birth in this samsAram, I pray at the lotus golden feet bhUthathAzhwAr who blessed us the most nectarean iraNdAm thiruvanthAdhi and who was born in thirukkadalmallai which is flocked by most glorious and cooling pearls (pearls - since this dhivyadhEsam is on the beach superficially it simply means pearls, but the inner meaning is pure devotees of bhagavAn).